The just-released study, “The Hindu Kush Himalaya Assessment: Mountains, Climate Change, Sustainability and People”, a collection of papers by a large number of scholars, by the Hindu Kush Himalayan Monitoring and Assessment Programme (HIMAP) of the the International Centre for Integrated Mountain Development (ICIMOD), has said tha tair pollution in the Hindu Kush Himalaya (HKH) is on the rise and regional air quality has worsened in the past two decades. Pointing out that the adjacent Indo-Gangetic Plains (IGP) having become one of the most polluted regions in the world, the study believes, the causes include rapid urbanization and population growth, with emissions from diverse pollutant sources -- cookstoves, brick kilns, other industries, power plants, and transport. According to the study, persistent winter fog and haze have increased across, leading to reduced visibility and elevated air pollution just south of the HKH and affecting air quality in the HKH as well as in the IGP. The winter fog reduces crop yields and affects tourism, impacting the lives of millions of people. Air pollution has large impacts on the Hindu Kush Himalaya (HKH), affecting not just the health of people and ecosystems, but also climate, the cryosphere, monsoon patterns, water availability, agriculture, and incomes. 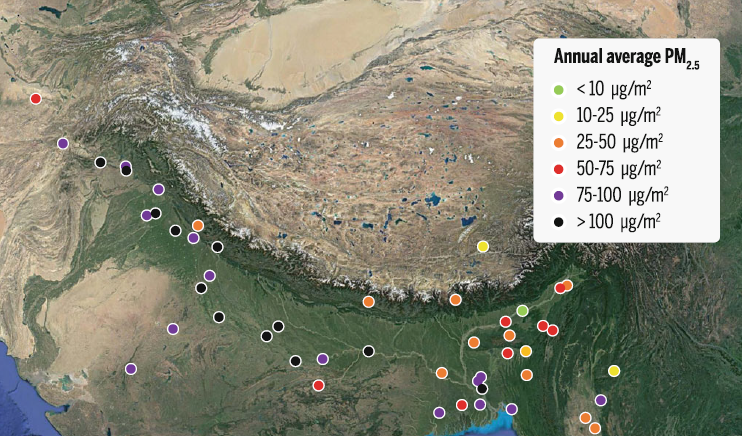 Although the available data are not comprehensive, they clearly show that the HKH receives significant amounts of air pollution from within and outside of the region, including the Indo-Gangetic Plain (IGP), a region where many rural areas are severely polluted. Photographs of snowy peaks against blue skies can give the impression that the Hindu Kush Himalaya (HKH) has pristine air quality. Unfortunately, days when such photographs can be taken are becoming increasingly rare. Recent decades have seen much of the HKH suffering from major air pollution problems. Three urban cities in the HKH, including Peshawar (Pakistan), Mazar-e-Sharif (Afghanistan), and Kabul (Afghanistan), are on the list of the 20 most polluted cities in the world. 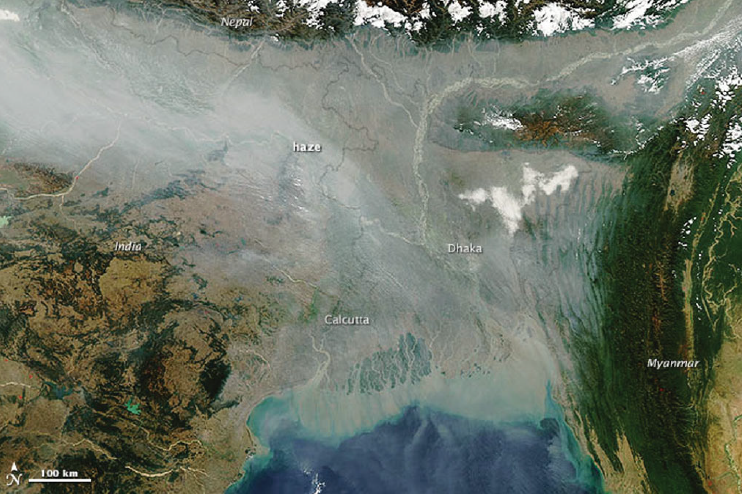 During a big fraction of the dry season, the heavily populated Indo-Gangetic Plain (IGP) just south of the HKH is covered by a thick aerosol haze that reduces visibility and obscures sunlight. The haze often penetrates deep into Himalayan valleys and at times even crosses the Himalaya to reach the Tibetan Plateau. Across the region, particulate matter (PM) -- both primary and secondary aerosols – as well as tropospheric ozone (O3)—a secondary pollutant—have increased. Many cities in the HKH have an annual average PM2.5 concentration higher than the World Health Organization (WHO) guideline of 10 lg/m3. Furthermore, in 12 cities (Allahabad, India; Patna, India; Dehradun, India; Delhi, India; Luchnow, India; Ludhiana, India; Peshawar, Pakistan; Amritsar, India; Rawalpindi, Pakistan; Narayangonj, Bangladesh; Agra, India; Jaipur, India), the annual average concentrations are more than 10 times higher than the guideline value. Meanwhile the IGP has seen an increase in persistent winter fog during the past two decades that is at least partly driven by increased air pollution, in addition to changes in moisture availability. The historical trends of black carbon (BC) reconstructed from lake sediment and ice cores at high altitude sites also show a dramatic increase in recent decades, starting in the 1960s. Different pollutants may be emitted by the same source, while many pollutants are chemically transformed in the atmosphere, forming secondary pollutants, such as secondary aerosols (both organic and inorganic, such as nitrates and sulphates) and tropospheric O3. Domestic cooking and heating, mainly using biofuels (e.g., wood and dung) is the largest source of CO and PM in the HKH. Cookstove emissions are also the largest source of BC in South Asia. This is due to low access to clean fuels and high usage of solid biofuel such as dung, charcoal, and fuelwood in the region. Agricultural residue burning takes place in two distinct forms. The first is the burning of small piles of collected agricultural residue. This may take place on the field, or near the homes, and the purpose might be to get rid of waste material or to generate smoke to chase away mosquitoes and flies from farm animals. Such fires are lit millions of times a day across the IGP and the hilly and mountainous parts of the HKH, in both rural and peri-urban areas. The second is the open-field burning of rice and wheat stubbles in the IGP after mechanical harvest using combine harvesters. The purpose is to clear the fields quickly for the planting of the next crop. Agricultural residue burning emits OC and BC aerosols, as well as a variety of gaseous air pollutants, including CO, CO2, CH4, NOx, and non-methane VOCs (NMVOCs). 21.32 Mt/year of residue is burned in Punjab alone, leading to 1961 Gg/year of CO, 53 Gg/year of NOx, 335 Gg/year of NMVOCs, 83 Gg/year of PM2.5, and 15 Gg/year of BC in the year 2008– 09. Agricultural residue burning is a large contributor to brown carbon (BrC) and SO2. These emissions contribute to the haze (ABC) and to the worsening of winter fog in the HKH. PM2.5 mass concentrations of 60–390 μg/m3 have been observed during paddy residue burning, with high OC contribution of more than 30%, in Patiala, Punjab, India. Approximately 250 Gg/year of OC and 60 Gg/year of BC emissions are estimated to be due to agricultural residue burning in the IGP. It was found that in the post-monsoon season, the OC derived from biomass burning contributed a large fraction of the total aerosol OC (40%) in Lumbini, Nepal, reconfirming the regional influence of agricultural residue burning. The open burning of waste contributes substantially to local and regional air pollution, and it is a common way to dispose of garbage in South Asia. Waste management is considered one of the most important issues in urban areas in the HKH. Indeed, public opinion shows that 59% of urban residents consider solid waste to be the most important problem in Nepal. In the same survey, only 7% listed air pollution as the most important problem; garbage burning is also one of the most poorly characterized emissions sources even in developed countries. During the dry season, especially from March to May, many forest and scrub fires occur in the southern HKH foothills of India, Nepal, and Bhutan. An average of 3,908 fire counts per year was recorded in this region. The average burnt areas were estimated to be 1,129 km2, with BC emissions of 431 t/year. Smoke plumes can reach altitudes of 4,000–5,000 m, which is much beyond the typical planetary boundary layer height in the region; this gives them a higher chance to undergo long-range transport for dispersion, but also brings them into contact with the lower reaches of the Himalaya cryosphere. The fired clay brick is one of the most widely used construction materials in the HKH and the IGP, and most of the brick kilns operate only during the dry season. While data on emissions from brick kilns is still lacking, there are estimates of almost 100,000 brick kilns across the IGP. In the Indian states of Uttar Pradesh and Bihar, almost 23,000 brick kilns are known to be in operation. There are no brick kilns in Bhutan and just over 100 and 1,000 brick kilns within the Kathmandu Valley and in Nepal, respectively. Indeed, 75% of global brick production is considered to be concentrated in four countries -- China (54%), India (11%), Pakistan (8%), and Bangladesh (4%) -- all part of the HKH. A significant source of SO2, NOx, BC, OC, and PM, are brick kilns as well as the primary fuels burned, matters in the resulting emissions. Fossil fuel combustion in the power sector contributes a large portion of SO2 emissions in the HKH, excluding brick kilns. Diesel generators are an important source of emissions that are often neglected; they are used to meet power demand during frequent power shortages in the region. Over ten million diesel pumps are estimated to be in operation in the IGP consumed by these pumps. Distributed generator sets are a significant pollution source and contribute to local and regional air pollution, especially during the winter and pre-monsoon seasons due to the prolonged power shortages. BC emissions estimated from diesel generators in the Kathmandu Valley are 75% of diesel emissions. When power cuts were common in the Kathmandu Valley between 2009 and 2015, emissions from diesel generators were responsible for more than half of the total BC emissions. The transport sector contributes to emissions of all pollutants in all of the HKH countries. It is an especially important source of NOx emissions. For each of the eight HKH countries, the transport sector contributes from at least 12% up to 73% of total NOx emissions in a country. For countries with a substantial number of gasoline vehicles, CO emissions from the transport sector are also important. SO2 emissions from the transport sector illustrate the low fuel quality with high sulphur content used in the engines. Afghanistan, China, India, and Pakistan have substantial contributions by the transport sector to BC emissions, illustrating the existence of polluting diesel vehicles in these countries. The HKH receives pollution from sources within the region, both rural and urban, as well as from a number of regions outside. In spring, dust from the Thar Desert reaches the western and central Himalaya. South-eastern Tibet receives biomass-burning emissions from Myanmar, Bangladesh, and eastern India, while the northern parts of the Tibetan Plateau receive dust from the Taklimakan Desert. Pollution episodes at Mount Waliguang at the north-eastern corner of the HKH, as well as at Mount Muztagh Ata, in the Pamir range and in the Pakistani Karakoram, have been traced to Central Asia and the Middle East. Manora Peak in India receives pollution from the IGP, but also from the Middle East. The high-altitude areas of HKH were once thought to be relatively pristine, and it was assumed that the Himalaya acted as a barrier to block the transport of pollutants from South Asia to the Tibetan Plateau. However, the in situ observations have pointed out that the high Himalaya are particularly vulnerable to the haze accumulated in the foothills.